NEGAUNEE TOWNSHIP — In 2011, Marquette County Central Dispatch received approximately 35,000 calls for help. Last year, that number was up significantly, up to 53,000 calls. In order to help dispatchers work more efficiently and effectively, some changes were made to their workspaces. Three new workstations have been installed at the Michigan State Police Negaunee Post, which is also the home of Marquette County Central Dispatch. 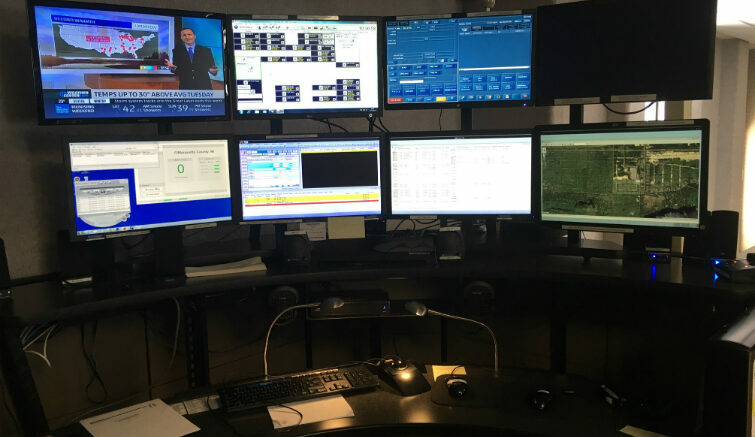 Marquette County 911 dispatch manager Gary Johnson says the new workstations are ergonomically built for dispatchers to either sit or stand at their choosing. “You need to have something that allows for the workflow so that they can view seven monitors and it needs to be designed so you can do that without neck pain and those kind of things,” said Johnson. “The work surfaces raise and lower so that they can stand at times and sit. If they’re getting too warm with all of the computers, they can turn on some air or if it’s too cold they have some heaters. Anything to keep them comfortable so that they can focus on their job,” Johnson added. Marquette County Central Dispatch employs a total of 12 dispatchers. Two dispatchers are always there 24 hours a day, 7 days a week. The dispatch center upgrades came to a total cost of $65,000.